In 3E 427, the Talos Cult began a conspiracy to assassinate Emperor Uriel Septim VII during a rumored visit to Vvardenfell. This was prevented by the Nerevarine, who executed the members of the cult in Gnisis by order of the Imperial Legion. 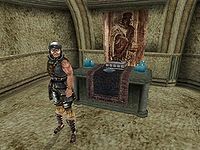 For more information, see the Morrowind Talos Cult article.